THANK YOU, MASTER RECYCLERS, FOR FIELDING THOSE TOUGH QUESTIONS ABOUT THE CURRENT RECYCLING CLIMATE AND KEEPING OUR COMMUNITY INSPIRED TO RECYCLE. Here are some FAQ's and Background to help you out. New changes for the Master Recycler Program! Thank you to Wing Grabowski for over 10 amazing years as the Senior Administrative Specialist for the Sustainable Engagement team at BPS and for the Master Recycler Program. Wing has moved to a new role for the Sustainable Engagement team as the Climate and Fix-it Fair coordinator. So Master Recyclers who volunteer with the Portland CAN: save your food campaign will get a chance to work more with him. 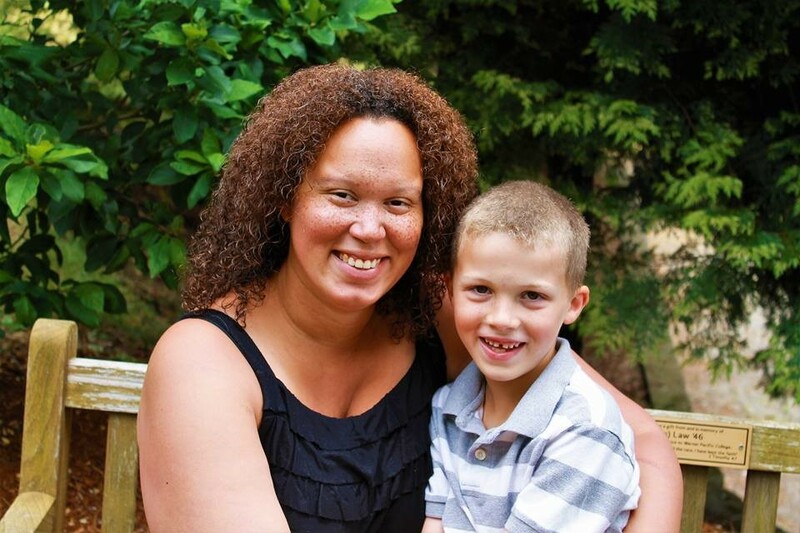 I am excited to introduce you to the new Senior Administrative Specialist! Many Master Recyclers got to meet Harmonee at the Master Recycler Gathering last week. She has already been busy filling the PACKED Master Recycler Calendar and jobseekers board. She is going to be an amazing asset for the Fix-it Fairs and other activities for the Sustainability Engagement team with all her connections and experience with events through her work in the Parks Department. ¡Bienvenidos a los voluntarios bilingües! Let your friends know how cool it is to be a Master Recycler! Spread the word that now is the time for Washington County residents to join. WHEN: Eight consecutive Wednesdays at 6:00 - 9:00 p.m. Starting Sept 5, 2018 and two Saturdays 8:00 am - 2:00 pm September 15 and October 6. COST: $50. Washington County hosts partial and full scholarships -no extra application needed. MROC had a second gathering in April. The group shared some awesome ideas of how to collaborate such as multifamily, immigrant, refugee, English second language outreach and education. MROC is still forming and it is a great time to join and help decide the new directions. 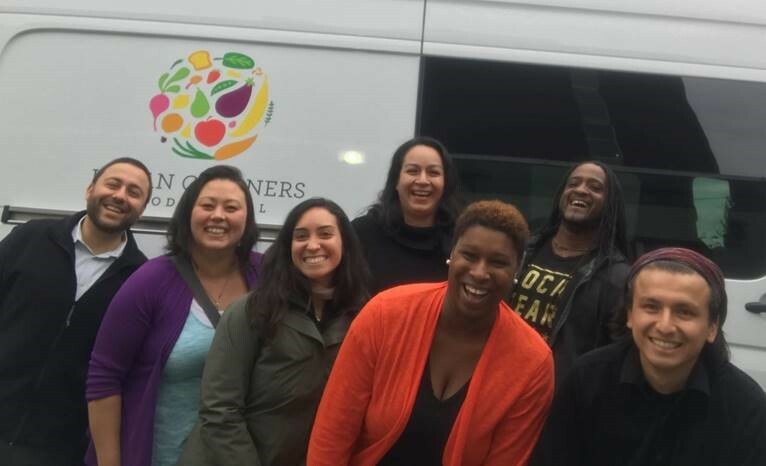 The group is open to any Master Recycler who identifies as a person of color as well as people who haven’t taken the Master Recycler course. The group is also considering a different name. Join the Westside Master Recyclers Facebook Group. Connect with other Master Recyclers in Western Washington County, Oregon. Keep posted about recycling topics and volunteer opportunities in the area. Ask for help with your events! Kris LaMar (Class 53) is a Master Gardener and a Master Recycler. She had the great idea that there should be a list of you “Dual Masters” who would like to be contacted when your dual knowledge might be needed. Please email MasterRecycler@portlandoregon.gov to be included. Once a list is formed, you will receive names and emails so you can network with your fellow ‘duals’. The June Calendar is PACKED with fun and meaningful ways to get involved this month. Thank you to all who volunteered in May. It was a busy month! Three Master Recyclers reached the honorable status of Centurion this month by volunteering more than 100 hours! Thank you for your deepened commitment and passion! Kate Davenport (Class 48) spent much of her early hours as a Master Recycler promoting the Rebuilding Center at home improvement shows. Her focus, however, has been organizing Neighborhood Cleanups for Grant Park. Seven of them! These events have great recycling and a reuse area thanks to her efforts. She is pictured here in her workplace. She worked at Metro's Hazardous Household Collection Center. Lori Gates (Class 63) is an active member of Westside Master Recyclers who organize PlantCon a community education and collection event and offer the community resources. 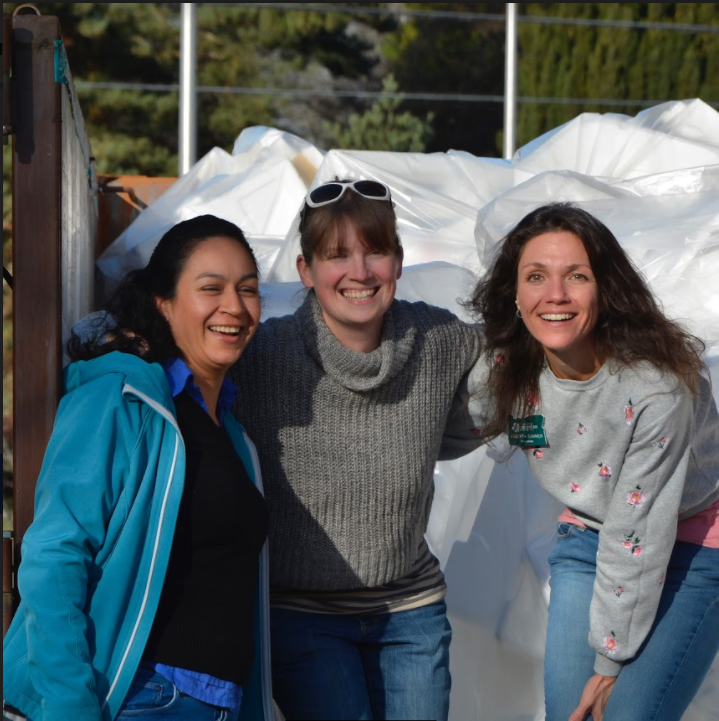 She has also been active in the Forest Grove Farmers' Market and the Bring Your Own Cup campaign for Recycling Advocates She recently became a Master Recycler Mentor so that she can share her enthusiasm and knowledge with new Master Recyclers. 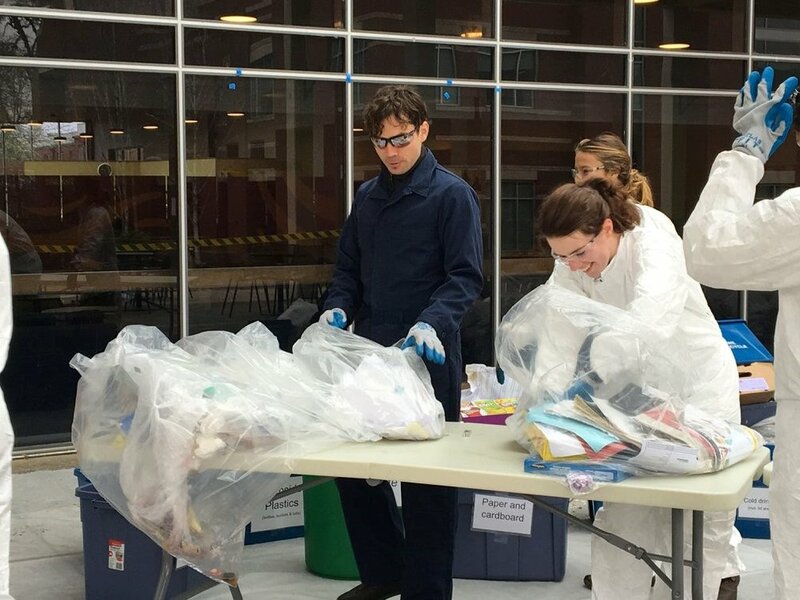 Eva (right) sorting waste with a smile. Eva Carlson (Class 66) spent much of her volunteer hours engaging students and businesses in the Eat Smart, Waste Less Challenge. The campaign gives fantastic meal planning, food storage and shopping tips to help avoid wasted food. As you can see, she also helped businesses better understand their operations by participating in waste sorts like the one at New Seasons. Jane Sund (Class 52) joined the Portland Sunday Parkways Green Team organizing recycling and composting at these massive events. She also helped recover materials at the Earth Day Cleanup event in her Piedmont Neighborhood. 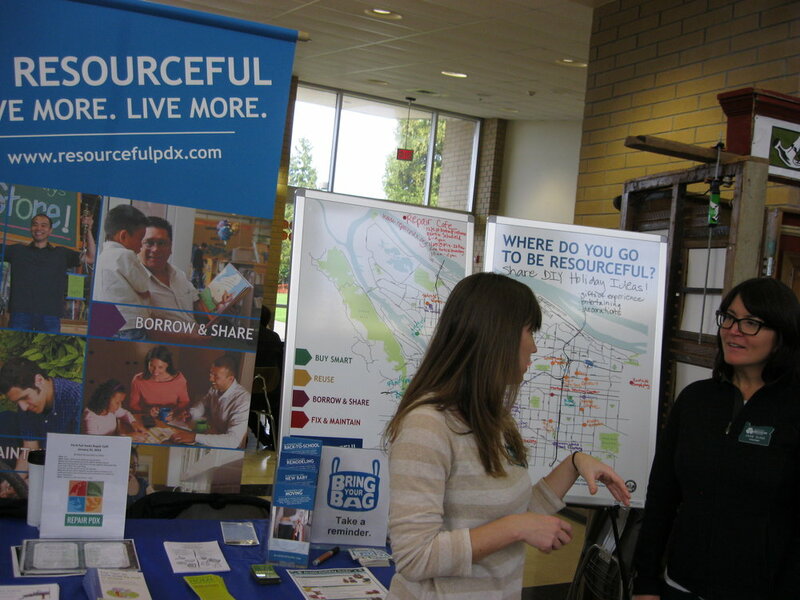 She is pictured on the right staffing a booth at a Fix-it Fair promoting reuse, sharing, borrowing and fixing. 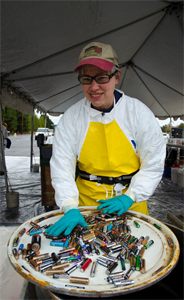 Stephanie King (Class 64) has been working to improve recycling and even encourage reuse at the Outlet Mall in Troutdale where she works. She started a small but mighty green team and she was on TV! She just happened to be at Agilyx recycling styrofoam from work when Koin 6 was looking for testimonial of customers! Lauralee Tyrell (Class 66) has repair fever! She has participated in 8 repair fairs since her fall Master Recycler class. It doesn’t matter where they are, Lauralee has gone to Hillsboro, West Linn, NE Portland and Beaverton to help folks get their lamps, clothes, bike and random small appliances fixed. She is already signed up for the upcoming Lake Oswego Repair Fair. Janet (left) with fellow volunteer. Janet Edwards (Class 67) focused much of her volunteer hours on wasted food and food waste. She offered a presentation on wormbins and backyard compost at her classmates workplace, went to Arbor Day Celebration to talk about curbside compost and recycling and shared tips to stop wasted food in a Multifamily community in Gresham and at Sunday Parkways in Portland. Janet is ready and excited to go above and beyond the 30 hour commitment! The summer is just getting started! Daniel (Center) at Quest Center with fellow volunteers. Daniel Rodriguez (Class 67) has been volunteering everywhere! He was in Beaverton helping with a compost give away (yes, the smell of compost is divine!). He was with his classmates in Gresham talking to residents in a multifamily community. But his big personal project was to organize a booth at the Quest Center Community Day. Daniel is just getting started! He has plans to join the Green Team at the Beer Festivals this summer (this picture is from last year) and several other person projects in communities where he already volunteers. You are amazing, Daniel! Emma (second to the right) at an event she invited fellow classmates to join. Emma Spanjer’s (Class 67) volunteer hours have been all about the triple bottom line of Environment, Equity and Economy. 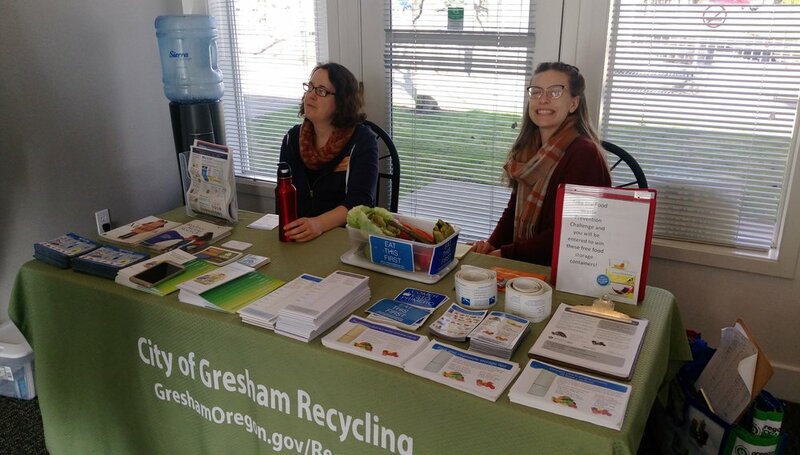 Emma organized a series of multifamily outreach days with fellow Master Recyclers. She also offered education on greener cleaners, food waste prevention and plastics in the ocean to kids in apartments and low-income housing in Gresham. On top of those projects, Emma organized a booth at the Zoo Earth Day celebration and presented at the Oregon Green Schools Summit. Some exciting jobs on the board this month. SCREENING of the new film ALBATROSS! Presented in Collaboration with HI Portland Hawthorne Hostel, Surfrider Foundation Portland Chapter, United Nations Association of Portland, Hawthorne Boulevard Business Association and Spirit of 77. Admission is free for all viewers, with donations being invited on a voluntary basis. ALBATROSS contains some intense emotional content around grief and death, so we recommend it for viewers age 12 and older. Come dressed as your favorite marine creature and get your photo taken at our "I ditched the straw" photo/selfie station. Win great prizes at our raffle too. Your participation also supports our awesome hosts, Spirit of 77, who is one of the growing list of Portland's bars and restaurants who have agreed to ditch the plastic straw and start an upon request policy for a paper straw alternative! Who: ReClaim It! + YOU! ReUse-a-palooza, bringing together local reuse loving organizations and community members to learn about reuse resources, volunteer opportunities and timely reuse news at a free, fun, and educational event!